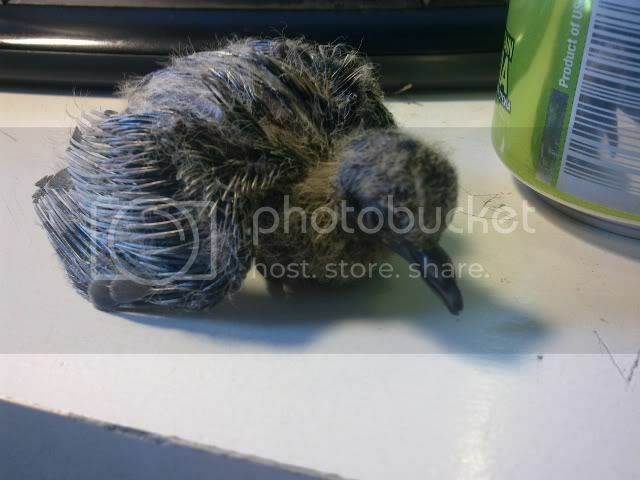 Hi i found this baby bird outside i left it alone thinking maybe the mom will come get it or something but she never did so i decied to take it and it was really weak and looked like it was dying i got some food into it and now its doing better but i cannot figure out what breed it is looks like it would be something like a crow or raven but its not from what i searched it has a really wierd looking beak ..any suggestions would be great i put it by a pop can so you could kinda see how small it is. You should try and find the nest or area it likely came from. 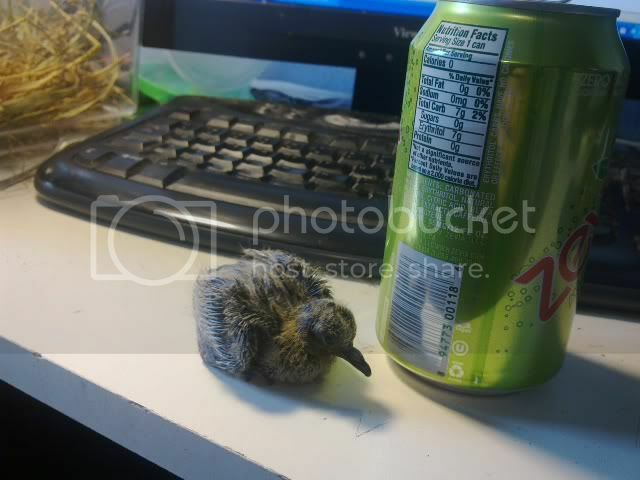 It got out of the nest before it could fly, but the parents will still care for it on the ground. It's best chance of survival is wit them, just make sure to put it out of the sun. I agree with apple, but as far as species, I believe that's a pigeon. Is there a safe tree nearby with lots of small branches not too far off the ground? If you leave him there, his mom will come feed him while he learns to fly. Mother birds can't come and retrieve a baby like an animal would. They just aren't equipped to pick their baby up and fly it back to the nest. The fledging process is very hard on birds, and they don't always make it, but finding it a safe small tree that will hide it from predators will give it the best chance of making it. Pretty sure it's a pigeon. Looks a little young to be a fledgeling. IM Eileen and see if she agrees. Pigeons are not protected so you can care for it yourself or try to find a pigeon person in your area; Google "pigeon rehab" in your area and see what comes up. Most wildlife rehabbers don't take pigeons; there's too many protected species needing our help this time of year. I know this was awhile ago, but what happened with the bird? I can tell you right now that it is a pigeon. 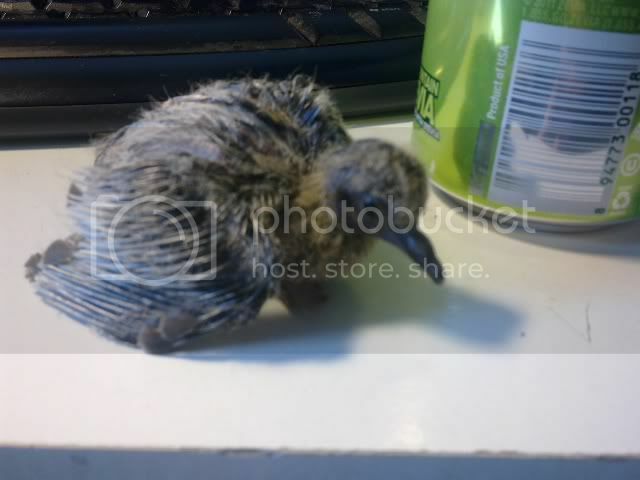 :] We've raised them here when they get knocked from nests. Whoa! Looking at baby pics, they certainly do look similar. 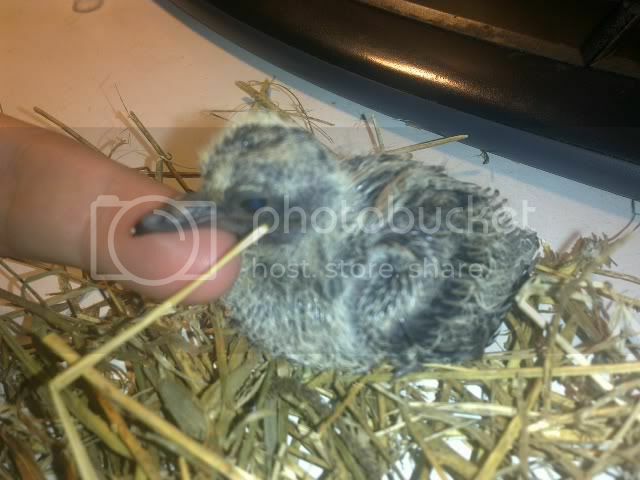 The dove babies seem to have a bit wider beak, though. That guy definitely looks like the common pigeons we have around here, though. Theyre such funny looking babies. I'm tough as glass and clean as night. Pigeons are a type of dove, so it's no surprise they look similar. This bird's coloring seems to fit with a baby mourning dove, but pigeons come in a wide variety of colors. It could be either one as far as I can tell.